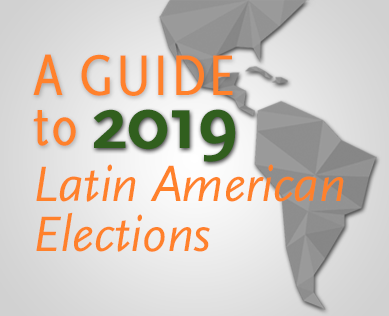 Six countries in Central and South America elect new presidents in 2019. Elsewhere in the Americas, Justin Trudeau will be vying for a second term as prime minister when Canada holds federal elections on October 21. Additionally, Guyana—which is on track to surpass Mexico and Venezuela to become Latin America’s second-largest oil producer in the coming decade—will also hold general elections in 2019 at a still-to-be-determined date. AS/COA tracks the votes through articles, poll updates, podcasts, and programs. Learn about what the 37-year-old former mayor plans to do as president. Can Nayib Bukele win outright on February 3? That’s the big question—and the result is not a given. Will El Salvador's Nayib Bukele Be the Next Social Media President? Thelma Aldana made her mark in Guatemala’s fight against corruption. Is she ready for politics?